Very Difficult, Very Rewarding. 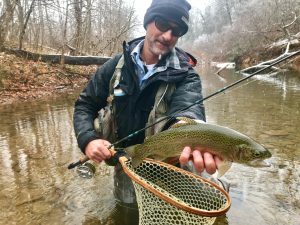 Winter fishing in Va.
As the chill of fall and winter set in, a lot of Virginia anglers head out. This fall has been very different. The low clear water we had this summer seems to have a tight hold on us. Although it made for outstanding smallmouth fishing this summer and great sight fishing for musky once the temperatures cooled off. It has made the trout fishing very challenging. There are two ways to view this very unique situation. In 16 years I can not remember water flows this low, this time of year. I will start with what I hear most anglers saying, ” I haven’t been out much, it’s just to tough.” There is no disputing that. Water levels have been so low for so long that the fish are much more paranoid then normal for this time of year. 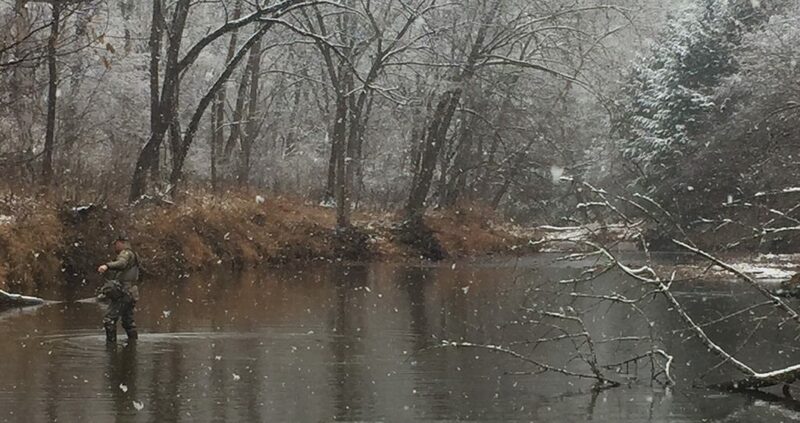 Winter fishing in Virginia even at it’s best is much different then spring and fall. Long leaders, approaching the water quietly, and keeping your shadow off the water are a few tips that will help put more fish in the net. Shadows are a big factor during the winter months. With the lower sun angle shadows are much longer and more pronounced. Couple that with low clear water and you get super spooky fish. Approach your target staying low, quiet, and from down stream whenever possible will help with not shadowing fish. Longer leaders will help keep the ripples of your fly line further away for the fish. I’m a big advocate of always keeping as much fly line off the water as possible especially for trout. The two main reasons, to avoid spooking them and more natural drifts with dries and nymphs. The second, unfortunately not heard as often, ” I love these conditions, I learned so much.” We all love catching fish however, there are days that a fish might be it or maybe even no fish. Remember, it’s called fishing for a reason. 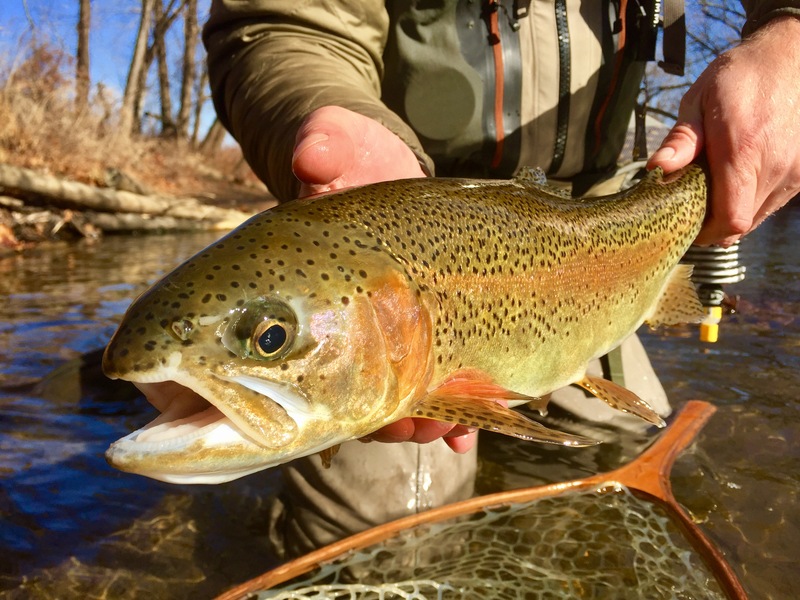 Virginia anglers have an opportunity right now to see rivers and fish behavior that we may never have the chance to observe again. Nothing will help you catch more fish then understanding and identifying fish habitat and behavior. If you would like to take your time on the water to the next level, I highly recommend spending as much time as possible on the water right now. The opportunity to clearly see bottom structure i.e. depth/contour change, submerged structure, structure change is seldom better. All things that create feeding lanes, holding locations and protection for our finned friends. 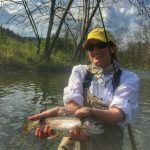 If you are observing locations that you have seen or caught fish from before and don’t see fish now? Be sure to look for undercut structure such as rocks and banks where they may hide in low water or when they feel threatened, that might not be noticeable in higher water situations. Anything and everything you can take note of right now will not only help your winter fishing it will also be invaluable knowledge for the future. On to my favorite part, observing fish behavior. I love it and the truth is, I enjoy watching most fish species refuse my fly rather then eat it. Musky and tarpon are the exception to that. Seeing them refuse my fly drives me crazy. Eat it, eat it, eat it, aw damn it. We’ve all said it. Anyways, back on track. Observing fish behavior. First off, in low clear water it’s easier to see the fish. Second, you will be able to observe them when they are more uncomfortable and paranoid then normal. Why do I enjoy seeing see fish refuse my fly? 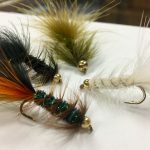 Because I can start my processes of elimination, was it the fly size, color, presentation, was it the tippet, did they see me, my shadow, rod tip? These are all things anglers are in control of, can modify and often times the reason the fish didn’t eat. Watching how they behave and where they go after they refuse a fly is also something to pay close attention to. If they return to the exact location they were, I find it was my presentation or size of fly that turned them off. If they go to a different location it was either my tippet size, or me that spooked them. I could go on for days about what I observe and pay attention to on the water. 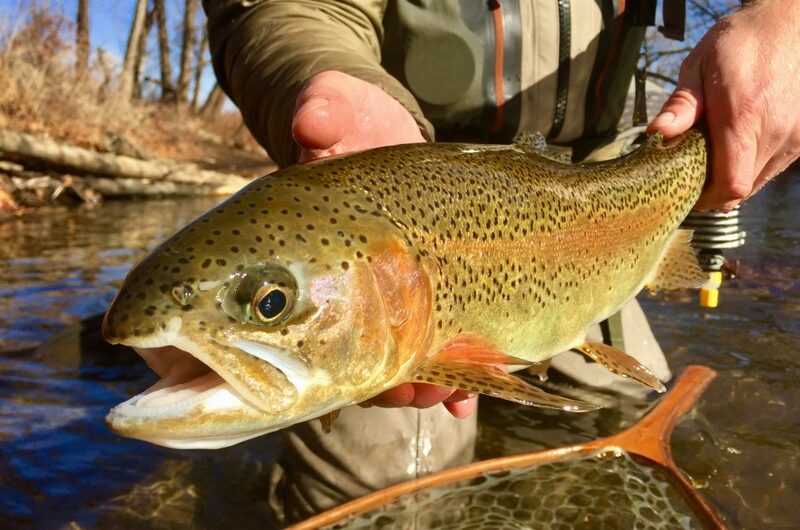 The bottom line is, the more time you spend on the water the more subtleties you will hopefully notice in relation to fish habitat and behavior. This should translate into you spending more time in habitat that holds fish which should result in catching more fish. Hope to see you on the water doing some winter fishing.